A few weeks ago, I led a virtual half-day retreat for my Spotlight Speakers Collective ladies. One of my gals shared with her sisters the steps she had taken to explode in her coaching business, book speaking gigs throughout the country, and, as a result, buy her dream car – all since we had last convened in person about 90 days ago. What was remarkable to me about this client’s success was not the sophisticated action steps she had taken. And rather, what she had stopped doing en route to advancing her thought leadership. Most of us, if we are really honest with ourselves, know what is standing in the way of becoming a hotshot speaker in our space and having a waiting list of clients waiting to work with us. But we delude ourselves into thinking the answer must be more complicated. Otherwise, wouldn’t everyone be doing it? Over the last 12 years, I’ve personally coached 200+ entrepreneurs and business leaders and supported thousands more through my online and live trainings. Those who step into thought leadership stop doing the following things. When I first took my business online, a fellow speaking coach shared in a group we were both a part of that she had gotten to six-figures in six months without a website. At first, I seethed with envy. Then, I stopped the seventeenth rewrite of web copy I was working on and instead started getting my own prospects on to sales calls, made bolder asks, and finally started closing. While a great logo, website, and overall brand can certainly amplify one’s thought leadership, too many emerging thought leaders are hiding behind revising their initial marketing assets rather than on trying out their programs and content on real clients and audiences. Brand development becomes easy peasy, and a more accurate reflection of your voice and vision when it emanates from the work you are doing in the world (versus the work you may, possibly, one day embark on). Another way of hiding, I mean self-sabotaging thought leadership (and as a result, real impact), is to become a content creation machine. While creatives always fight me on this, if your goal is to serve your audience, you’ll actually serve more people by developing a handful of signature offerings and relaunching each several times successfully before creating more. This is the only way both to gain traction and be a visible face for your business. After I crossed the six-figure mark, I hit a revenue plateau when I had a year where I developed and launched two different online programs and an offline live event. Too much behind my computer screen time creating eclipsed the time I spent growing (and more importantly, nurturing) my tribe. Every one of my clients who becomes a true thought leader develops a signature speech, workshop, retreat, coaching program, VIP Day – whatever it is – and launches/fills/books it again and again before adding more things into the mix. 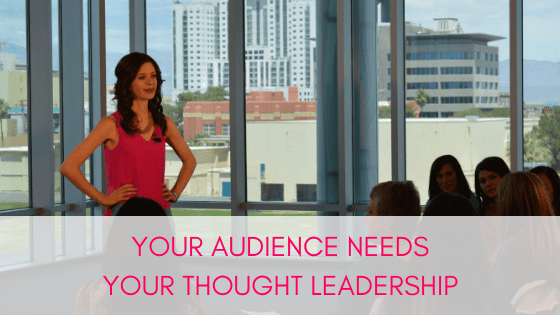 Whether you are wordsmithing an “idea worth spreading” or call to action for a speech, a thirty-second answer to the question, What do you do? or copy for a sales page or speaker one-sheet, it’s vital you communicate what you do in the language your target people use and think in. Having a fresh voice and unique point of view does not mean you make-up words, acronyms, confusing frameworks, or flowery narrative descriptions. You have to find the sweet spot between authentic communication and relevance to your target audience. Once people hire you, join your program, or see you speak, then you can introduce them to more abstract concepts. But they have to know, like, and trust you first! Whether you lean scientific or soulful, use plain-speak with the people you want to secure opportunities with and be clearer than an ungarnished vodka tonic about the outcomes you, your programs, and your presentations facilitate. When we are initially building our businesses, we need to build mutually-beneficial relationships with people who are true prospective clients. As we transition out of the baby and toddler years of our business, it becomes critical to cultivate mutually beneficial relationships with those who can send us our dream clients, champion us for more high-profile speaking, consulting and media opportunities, or outright book us on their live and virtual stages so we have access to larger audiences beyond our own. While it can feel cozy to hang out in Facebook Groups or show-up to local networking events, often times we are spending our time with folks who can be friends and cheerleaders but can’t really play a role in helping us achieve our business and thought leadership goals. Identify who the movers and shakers in your industry are. Follow them. Champion them. It takes a while to stand out. When you keep showing up for the people who are a few circles around the sun in front of you, and adding real value, they will likely notice. During my Step into Your Moxie book launch, several women in my community reached out and offered to interview me on their podcasts and book me as a speaker for their associations, companies and industry events. I appreciated this cheerleading immensely. And you better believe that if they reached out down the road for a favor, if I could perform it, I would! Now, I’m curious, which of the understandable but cray cray behaviors do you realize you’ve turned into self-sabotaging thought leadership habits?